Become the Guildmaster of the Thieves Guild. Receive Guild Master's Armor from Tonilia. Periodically search Guild Master chest for loot. Note: This section only describes prerequisites for this quest. The quest will not begin until you complete all prerequisites. In order to restore the Thieves Guild to its former glory and assume the title of Guild Master, you must perform small jobs in four holds of Skyrim: Haafingar, the Reach, Whiterun, and Eastmarch. To get an improvement job, talk to Delvin Mallory or Vex; you can have one quest active from each. Once you have completed five jobs in a particular hold (except the Rift, where the Guild already has influence), Delvin will offer you a special "reputation" job to increase the Thieves Guild's influence there. You may start taking these jobs at any time after officially joining the guild (completing Taking Care of Business). Completing all four reputation jobs is a prerequisite to becoming the Guild Master. You are assigned targets at random, without regard to the number of jobs that you've already taken in a particular hold. You can check your Quests log to review how many jobs you've completed per hold. You can accept and quit the jobs at will, which can be used to your advantage if you are assigned jobs in holds that you have already completed, and if you wish to increase your efficiency by matching two jobs to the same hold. If one of Vex's jobs will take place in the same hold as Delvin's, such as a sweep job and a bedlam job both in Eastmarch, then the value of the objects assigned to be stolen in Vex's jobs also applies to targets in Delvins's Bedlam jobs, and both can be completed together. This is an easy way to steal two birds with one... theft. However, there are fewer jobs offered in the Reach (Markarth) than in the other three holds, so it's best to take any job there that you can get. All failed jobs will be listed in the completed quests list. For each reputation job that you complete, the Thieves Guild's headquarters is incrementally improved. Each successful completion adds a merchant to the Ragged Flagon, and completing the third and fourth jobs adds recruits to the guild. Completing these jobs also increases the gold available to all of your fences up to a maximum of 4,000. In addition, gradual cosmetic improvements occur in the Ragged Flagon - Cistern; a carpet will be placed in the center platform in the middle of the room, and banners of the Thieves Guild will be emblazoned on the walls. Also, when you are arrested in a hold over which the Thieves Guild has influence, you will be given an option to bribe guards even if you don't have the Bribery skill perk. Whiterun Imitation Amnesty: Help get a convicted prisoner released from jail. The Reach Silver Lining: Recover a stolen silver mold for a silversmith. Eastmarch Summerset Shadows: Remove a rival guild from the picture. Haafingar The Dainty Sload: Frame a ship's captain to get revenge for a jilted merchant. 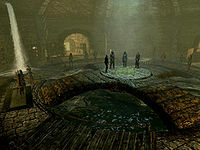 When you enter the Cistern, a crowd will be gathered, including the Thieves Guild regulars, Karliah, and Maven Black-Briar. After you speak to Brynjolf, there is a short ceremony, during which you are named Guild Master. After the ceremony, you must again talk to Brynjolf, who will hand you the Tribute Chest Key and the Amulet of Articulation. The key unlocks the chest near the Guild Master's desk. The Guild periodically places loot in here as a tribute to you, and you are free to take it. Brynjolf also tells you to see Tonilia about getting your Guild Master's Armor set. The Guild Master's Armor set appears graphically similar to the set Mercer Frey wears, and is just a boosted version of your other Thieves Guild Armor. If you complete the last two special jobs at the same time and then become guild master, you can turn in for both special jobs and have Delvin compliment you twice, saying you're the best thief in the place, despite his assertion that he'll only ever tell you once. In order to complete this quest as quickly as possible, it is possible to immediately quit a job and ask for another in order to get one in a particular hold. There are no penalties from Delvin or Vex, however, avoid doing this with the Burglary, Fishing, and Heist jobs due to associated bugs. You can also make a save just before taking a job and reload it until you are given the desired hold; this avoids any negative consequences. The quest may not start even after completing all other Thieves Guild quests. Use the console command setstage TGLeadership 10 to start the quest manually. If you've sold all of your Thieves Guild Armor, you will not be able to get the Guild Leader Armor from Tonilia. This bug is fixed by version 1.4.15. of the Official Skyrim Patch. There are spare pieces of Thieves Guild Armor in The Ragged Flagon - Cistern, in the training room, with the locked chests. You can pick these up and trade them in for the upgraded versions, which also allows you to get the Guild Master's Armor and the achievement. If you complete the main story quest before doing the improvement quests for Vex and Delvin, Brynjolf may not interact with you and instead repeat that he is busy, making it impossible to become Guildmaster. A possible fix is to run outside when finishing your first interaction with Brynjolf. You need to run outside as quick as possible by going to the ladder and exiting. You should see the quest update pop up reading: "Started Under New Management". Afterward, go back inside and proceed to Brynjolf. To talk to Brynjolf, let him go to the middle of the Cistern first, and wait. Another possible fix is to get the quest about fixing debt from the guy at the Riften stables. The player will be told to talk to Sapphire. Instead, Sapphire should be sitting on the bridge just inside Riften and when approached will say "I don't have any business with you." or "We'll talk after the ceremony." Attack her 3 times, and this should cause her to start attacking the player notifying them that "Under New Management" has been completed and that the player should talk to Brynjolf. Upon entering The Ragged Flagon, the player will be required to pay 1000 gold to Vex as reparations for killing a fellow Thieves Guild member. After doing so, speak with Brynjolf and the questline should be completed. This can also be fixed with the console command setStage TGLeadership 0, which will start the quest chain if you have already done the main quests mentioned above. Saving in the Cistern while this quest is active, before the completion of the ceremony, may cause the game to freeze. This includes autosaves when opening the character menu, but not the autosave that occurs due to entering the Cistern. ? If you leave the area before talking to Brynjolf, the quest may become blocked making it impossible to complete. After the ceremony, Rune may continue to repeat the dialogue, "I think everyone is waiting for the ceremony to get going." Although this does not affect gameplay. If the quest is completed, only Delvin Mallory and Vex will greet the player as their guild master. Other lower-ranking members of the thieves guild have their greeting dialogue bound to the stages of this quest. If the player does not receive the guild's master armor from Tonilia, their dialogue will be spoken as intended, though they cannot interact with you and will not offer training. It does not affect gameplay. ? 200 Finishes quest With the ceremony complete, I've become the Guild Master of the Thieves Guild. As a benefit of my position, I've received a suit of Thieves Guild Leader's Armor, the Amulet of Articulation and the key to the Guild Master's Tribute Chest. The following empty quest stages were omitted from the table: 0, 70. On the PC, it is possible to use the console to advance through the quest by entering setstage TGLeadership stage, where stage is the number of the stage you wish to complete. It is not possible to un-complete (i.e. go back) quest stages, but it is possible to clear all stages of the quest using resetquest TGLeadership. This page was last modified on 25 November 2018, at 19:46.